Actor Charles Paris has been separated from his wife Frances for several years, but she is willing to reconcile. However, first he must give up drinking, a habit that has led to many past problems in their marriage. As Charles considers this difficult decision, he is given a role in a play portraying a monk. He’s a little suspicious about how easily the part was offered to him, but he can’t afford to turn down the chance at a steady paycheck. Before the play opens, one of the cast members is found dead at the theatre and Charles decides to investigate. I’ve read most of the books in this long-running series. New readers wouldn’t have a problem catching up on the plot, but since this is far from the best in this series, I would recommend starting with one of the earlier books. 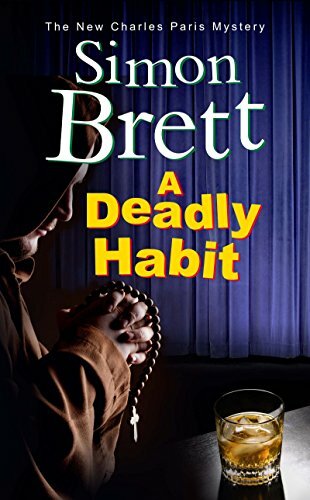 Although A Deadly Habit deals with a serious issue as Charles begins to realize his drinking really is a problem, it is still filled with Simon Brett’s trademark wit. I love the references to unfavorable reviews of Charles’s past performances sprinkled throughout the book. I have always enjoyed the behind-the-scenes look at life in the theatre as well. Most of the ingredients are there, but somehow don’t come together as well in this outing compared to prior books in this series. The pace is even and Charles does spend quite a bit of time investigating the murder but it almost seems like an afterthought to him and the authorities. A lot of the book is focused on Charles’s efforts to get sober which sets a more somber tone than most of Brett’s books. Charles gets results from what he learns in the investigation, but not in the expected manner. I didn’t care for the book’s ending, although it is true to Charles’s character. He has always been his own worst enemy, but this time his actions are more bittersweet than usual.